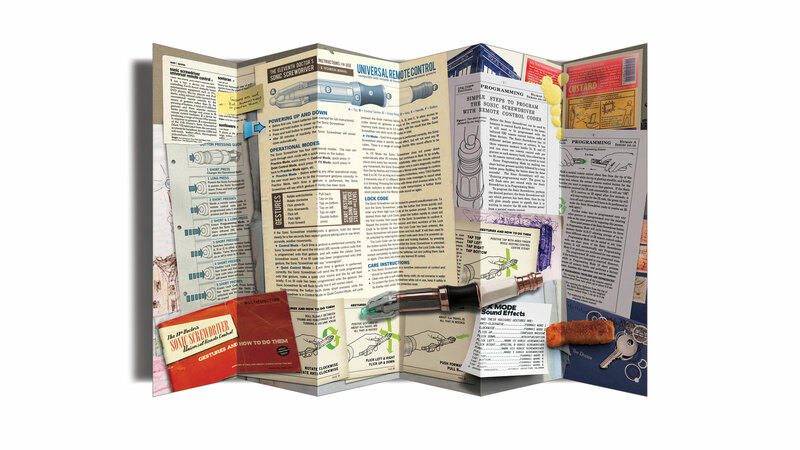 Click here to download a PDF the original Eleventh Doctor’s Sonic Screwdriver manual. The Eleventh Doctor’s Sonic Screwdriver was originally fabricated by the TARDIS after the Tenth Doctor’s screwdriver was completely destroyed. Apart from being bigger than the Tenth Doctor’s one, it differs from the previous model in shape, power, its distinctive glowing green tip. The Wand Company have created this Universal Remote Control version specially for Earth use. It has been simplified so as not to cause danger to human operators, while still being a very powerful and useful device capable of controlling almost all types of home entertainment equipment. To avoid confusion and potentially chaotic usage, this model has had its psychic control interface disabled. However, humans will still be able to access its full range of functions after studying the information presented here in this manual. This Sonic Screwdriver universal remote control is not a toy: it is a device for remotely controlling home entertainment equipment such as TVs, DVD players, Blu-ray players and iPod docks, using infrared codes learned from conventional remote controls by the means of gestures rather than by pressing buttons. A total of 13 different gestures and three separate memory banks enable it to learn up to 39 remote control functions. In FX Mode, the Sonic Screwdriver produces 12 different sonic buzzes, beeps and scanning sounds from the universe of Doctor Who, all at the press of a button, and has the power to instantly turn off almost any TV without any set up required. This Sonic Screwdriver is not only a remote control, but is a reproduction of the Eleventh Doctor’s Sonic Screwdriver, fabricated from die cast metal, acrylonitrile butadiene styrene (ABS) and soft-touch, leather-effect, thermoplastic polyurethane (TPU). Use only good quality alkaline batteries – do not use rechargeable batteries as their voltage (1.2V) is not enough for the Sonic Screwdriver to function properly. In any operation mode except FX Mode, press and hold the button (a long press) to power up or power down the Sonic; after 30 minutes of inactivity the Sonic will power down automatically. Extending the Sonic reduces its remote control performance in terms of both distance and control angle. For optimum remote control performance, please only use the Sonic as a remote control when retracted. Each time a gesture is performed correctly, the Sonic Screwdriver plays a specific sound effect, but will not send any IR codes. There is a range of vintage Doctor Who sound effects to be discovered. In FX Mode the Sonic Screwdriver does not power down automatically after 30 minutes, but continues to flash its tip briefly, about once every two seconds, indefinitely. After one minute without any movement, the Sonic Screwdriver runs a quick diagnostic routine then the tip flashes and it transmits a Morse code message to confirm that it is OK.
For as long as it remains motionless, every 1963 flashes it transmits one of 11 different Morse code messages to report what it is thinking. Pressing the button with three short presses while in FX Mode switches to silent Morse code transmission; a further three short presses turns the Morse code sound on again. 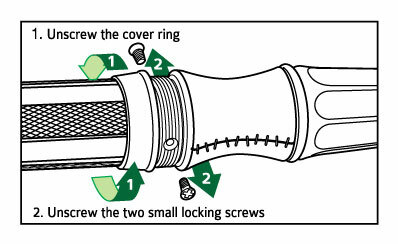 The Sonic Screwdriver can be locked to prevent unauthorised use. To lock the Sonic Screwdriver, press the button four times quickly and enter any three digit Lock Code at the spoken prompt. To enter the desired three digit Lock Code, press the button rapidly to count out the first number, then pause for the Sonic Screwdriver to confirm it. Repeat the process for the second and third numbers of the Lock Code to be stored. As soon the Lock Code has been entered, the Sonic Screwdriver will power down and lock itself. It will then need to be unlocked by entering the correct code each time it is powered up. The Lock Code can be erased and locking disabled, by pressing the button quickly five times whilst the Sonic Screwdriver is unlocked. 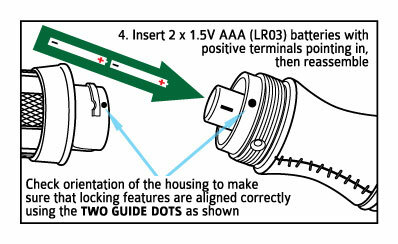 In the event that the Lock Code is forgotten, the Lock Code may be erased completely by taking the batteries out and putting them back in again. (This does not erase any learned IR codes). Enter Programming Mode by making two short button presses quickly followed by a long button press (holding the button down for three seconds), while in Practice, Control or Quiet Control Mode. The Sonic will say, “Entering programming mode”. The tip will flash once per second while the Sonic is in Programming Mode. To program the Sonic, perform the desired gesture; the Sonic will say which gesture has been done, then its tip will glow steady green to signify that it is waiting to receive the IR code (button press) from a normal remote control. Hold a normal remote control about 3 cm from the tip of the Sonic while the tip is glowing steadily, and briefly press and release the normal remote control button for the function you want to program on to that gesture. If the Sonic received the IR code successfully, it will say “OK”. If it receives no IR signal after five seconds, it will stop waiting for the IR code, the green tip will turn off and a gesture will have to be performed to make the Sonic ready to receive an IR code again. The programmed IR codes are preserved even if the batteries are changed or removed. However, while in Programming Mode, ten short presses erases all memory banks and performs a factory reset. Caution: this operation can not be undone. Try varying the duration of the original remote control button press from very brief up to about half a second. – Try varying the distance from the tip of the Sonic to the original remote control from 1 cm up to 5 cm. – Try replacing the batteries in the original remote control. – Use new alkaline batteries in the Sonic Screwdriver. The Eleventh Doctor’s Sonic Screwdriver has 13 gestures and three memory banks, and as one remote control code may be stored for each gesture, 39 remote control codes can be stored in total. The gestures are: Push, Pull, Rotate clockwise, Rotate anticlockwise, Flick up, Flick down, Flick left, Flick right, Tap on the top, Tap on the bottom, Tap on the right, Tap on the bottom, Double button press. 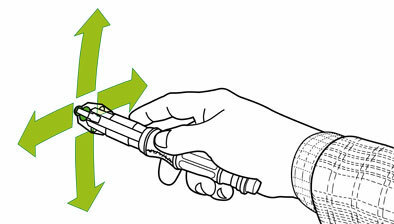 To do the tap gestures (top, left, right and bottom), hold the Sonic Screwdriver steady and level and tap the Sonic smartly on the main cage body just in front of the grip part of the handle. 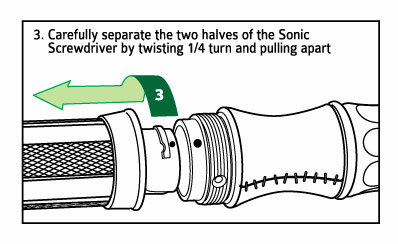 For at least half a second before the tap make sure that the Sonic is steady and level, the Sonic is looking for a single tap event either from the top or the bottom or from either side. The tap may be performed using the forefinger of the hand that is holding the Sonic. The directions of the tap gestures are independent of the rotation of the Sonic. Each time the Sonic is rotated it recalibrate its idea of up, so that up is always up in the real world regardless of which way up the Sonic is. This means that “tap-on-the-top” is always a tap on the side of the Sonic facing upwards regardless of the rotation of the Sonic and hence the position of the grip button. As a result, you can rotate the Sonic in your hand to make it easier to do the “tap-on-the-right” or “tap-on-the-left” gestures with the forefinger of the hand holding the Sonic without straining your hand. The Eleventh Doctor’s Sonic Screwdriver comes with its own stand and protective cover. When displaying the sonic on its stand, make sure that the stand is stable on a firm surface and out of reach of small children. If the Sonic is in FX Mode, while motionless on the stand, its tip will start to flash and after one minute it will transmit a Morse code message to confirm that it is OK, and then every 1963 flashes (about one hour) it will transmit one of 11 of the Eleventh Doctor’s well-known words and phrases. This Sonic is a sensitive instrument of control and should be handled with care. Clean only with a soft, slightly damp cloth; do not immerse in water. To protect the Sonic while not in use, keep it safely in its display case under the protective cover. The Sonic has many features but only one button, and therefore requires a number of different button pressing sequences to access these features. Depending on the mode the Sonic is in, certain button pressing sequences will do different things. FX Mode has been designed especially for play and cosplay. In FX Mode the Sonic consumes very little power unless the button is pressed. In all other operational modes, the Sonic must be turned on before it can be used. Pressing and holding the button for 3 seconds, turns the sonic on and off. In FX Mode, a double press plays the alarm warning siren. In FX Mode, a quick triple press toggles silent Morse code on or off. In any operational mode, a triple press where you hold the last press for 3 seconds makes the Sonic go into Programming Mode (note, a single short press exits Programming Mode). In any operational mode, doing four quick presses enables the lock code sequence. After pressing the button 4 times quickly, enter any three-digit Lock Code at the spoken prompt. To enter the desired three digit Lock Code, press the button rapidly to count out the first number then pause for the Sonic to confirm it. Repeat the process for the second and third numbers of the Lock Code to be stored. As soon the Lock Code has been entered, the Sonic will power down and lock itself. The Sonic Screwdriver will then need to be unlocked by entering the correct code each time it is powered up. (Note five quick presses when the sonic is unlocked erases the lock code). In the event that the Lock Code is forgotten, it may be erased completely by taking the batteries out and putting them back in again. (This does not erase any of the learned IR codes).